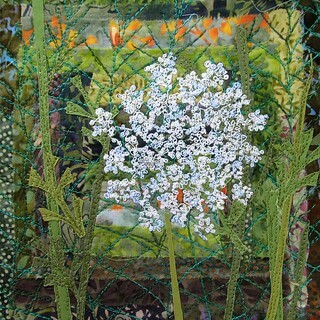 Queen Anne's Lace is one of those things I grew by mistake, but I am pleased it is here. I used to pick it for the girls to dye different colors by adding food color to the water. When they were wilted and dreadful, I'd toss them into the garden, where apparently they have volunteered and thrived. Like ferns, these are self-similar, and like ferns, I can fall into the details of the blossom, admiring the levels of umbels and umbellets and tiny flowers. I have spent an inordinate amount of time trying to print Queen Anne's Lace, with no success at all. This idea has come closer than most.